Chorus: “We circle your home / Watchful / Yet never thinking the worst”. Canadian Stage is currently presenting the Canadian premiere of The Arsonists by Swiss playwright Max Frisch. The play, first staged in 1958, is considered a classic of post-war theatre and it’s frankly surprising that it should not have been staged in this country until now. The original title is Biedermann und die Brandstifter and it has also been translated as Biedermann and the Firebugs or simply The Fire Raisers. The play had its first major English-language revival in 2007 at the Royal Court Theatre in London directed by Ramin Gray and starring the not-yet-famous Benedict Cumberbatch as one of the arsonists and Will Keen as Biedermann. That production, the first in England since 1961, used the new translation by Alistair Beaton, the same one that Canadian Stage is using. While director Morris Panych has mustered a great cast and gets much of the play right, various crucial errors undermine the play’s success. The play is set in a nameless town plagued by fires set by serial arsonists. Gottlieb Biedermann (Michael Ball in another iteration of his grumpy old man persona) slams down the newspaper stating they all should be hanged. Every time the modus operandi is the same. A stranger inveigles his way into a family’s hame and a few days later the house is in flames. At that moment Biedermann’s maid Anna (Sheila McCarthy, pert but not given enough to do) lets in a homeless man named Schmitz (Dan Chameroy), who is looking for some to give him some food. He is a wrestler left without shelter or employment after the circus where he worked burned down. Biedermann (whose name in German means someone who is honest and upright to the point of stuffiness) is eager to prove that he is not the run-of-the-mill person who would turn someone like Schmitz out and offers him breakfast. Plied with artful flattery Biedermann soon finds he has also offered the man a place to stay in his attic. 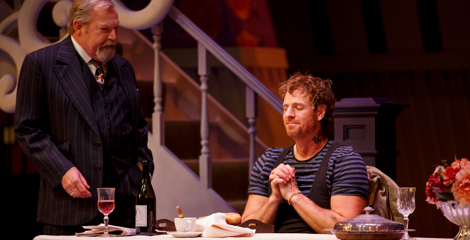 Soon Biedermann is joined by his friend Eisenring (a humorously straightforward Shawn Wright), a waiter now unemployed since the restaurant he worked in burnt down. Biedermann’s actions initially upset his wife Babette (Fiona Reid in her priceless flustered upper class matron routine), but even she finds she can’t throw them out. On the one hand, what motivates Biedermann is his maxim that the world would collapse if people were not able to trust one another. On the other hand, he has just fired one of his more faithful workers who commits suicide because of it and we suspect that Biedermann is atoning for his private guilt for an associate’s death with this ostentatious hospitality he gives a stranger. Once Schmitz and Eisenring begin moving in barrels of gasoline, Biedermann has the additional motive that if he acts against his two lodgers, they would harm him and his business. Befriending them is the only way to ward off any possible retaliation. Clearly, the play is a very dark satirical comedy, so dark in fact, that Frisch has furnished it with a chorus as in Greek tragedy. The chorus of firemen can, like their helpless counterparts in tragedy, do nothing but watch and wait while the dire events unfold. They can extinguish the fires but not prevent the perversity in the nature of mankind that leads to them. Panych’s method in dealing with the chorus is theoretically a good one. Rather than having a group of actors chant their lines as in the original or in the 2007 revival, Panych has had musician Justin Rutledge set the lines to rock music with electric guitar and percussion accompaniment. Greek choruses were originally sung so this makes some sense. The problem is that Rutledge’s poor diction makes the lines nearly incomprehensible. On top of that the sound engineering allows the instruments to drown out the vocals. Why have a chorus at all if you can’t hear what they’re saying? This is bad enough but Panych adds a conceptual problem when he has the two arsonists and Anna join in as part of the chorus. While according to the programme they are playing roles as part of the fire brigade, Panych does not make this absolutely clear. Their participation may have been dictated by budget constraints but it also makes nonsense of what the chorus sings and of their role as pathetic observers, not participants, of the action as it unfolds. A simple solution to a tight budget would have been to designate a single singer as the chorus. After all Shakespeare has a one-man Chorus in Henry V and Pericles. At least, if the technical problems were fixed, that would avoid confusion. Normally, Ken MacDonald’s sets are marvels of imagination. Yet, here the need for two playing areas – the main floor of Biedermann’s house and an attic – seems to have defeated him. The 2007 production had a two-storey set. Here, MacDonald has placed the two areas side by side with the attic stage right of the Biedermanns’ main floor and stairs going up then down between them. If the two areas must be in this configuration, surely having the “attic” raised on a platform would prevent the nonsense of steps over a stile. While Frisch gives no specific location for the play, MacDonald loads the eaves of Biedermanns’ house with such elaborate gingerbread scrollwork that it would be right at home in rural Ontario. In the midst of a high-level cast who give their standard fine performances, Dan Chameroy stands out for giving a performance of wit and intensity unlike anything he has done before. We know at once that he is a wily criminal (costume designer Charlotte Dean gives him a grenade tattoo on his left arm), but he uses the natural warmth of his voice and the studied innocence of his facial expressions to such marvellous effect that Schmitz’s soft-soap deluding of Biedermann is perfectly believable. When Frisch’s play was first performed the action seemed to refer to the rise of Nazism in Germany and specifically to Hitler’s rise to power through coercion and violence until the Enabling Act of 1933 gave him absolute dictatorial authority while the forces against Nazism failed to form a common front against him. As time has passed, the play has maintained its relevance concerning the rise of any totalitarian power or the left or right and seems to illustrate John Stuart Mill’s 1867 dictum that “Bad men need nothing more to compass their ends, than that good men should look on and do nothing”. While we have to be thankful that Canadian Stage finally has given this important play its national premiere, we also have to wish it could have done so with greater clarity and punch. Photo: Michael Ball and Dan Chameroy. ©2012 Bruce Zinger.